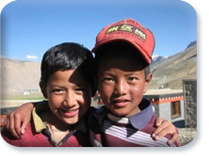 Sponsoring a child from Spiti is the most personal way in which you can establish an enduring connection with this Himalayan community. Follow the journey of a little boy or girl as he or she grows up; watch through the child’s eyes as the school develops, providing better facilities, resources and teaching for its students. You will have the satisfaction of knowing that your monthly contribution has made an enormous difference. Without the collective generosity of donors like yourself, the vital improvements necessary to provide Spitian children with quality education and a better quality of life would simply not happen. • Make a regular, monthly contribution to the general educational fund. You choose how much. 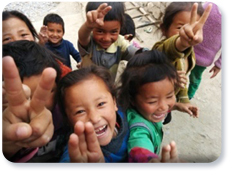 The general educational fund covers the expenses of all students under the care of the Rinchen Zangpo Society for Spiti Development, regardless of their financial background. Parents of children who attend Munsel-ling School pay a maximum of 25% of the cost of their child’s education – and this is only accepted from those families who can afford to do so. Children who come from much less well off families across the Spiti, Lahaul and Kinnaur valleys are educated free of cost at Munsel-ling. Your contribution will provide for tuition fees, uniforms, textbooks, meals, and accommodation for those staying at the hostel. You will receive the regular newsletter updating you on the life and activities of the children at the school. • Sponsor a specific child for a monthly contribution of £20 (UK), €25 (Europe), $35 (Canada), $33 (USA), Rs 2,000 (India) or the equivalent amount in other currencies. If you choose to sponsor a particular child, it is likely that that child will be from a family who cannot afford to contribute anything to his or her education. Your regular gift will pay for that child’s tuition fees uniform, textbooks, meals, and hostel accommodation if he or she is a boarder. It will free the school of financial responsibility for that child, enabling the school to spend its limited budget on other vital developments – building new toilets, equipping the science laboratory, extending the dining hall, and sending teachers on training courses, for example. Your child will write to you every year - please do write back! What is the Impact of Your Gift? Your regular gift has the power to open the door of opportunity to a child. Support a Spitian child's education today and lay the foundations for the child to realise his or her dreams. "I like studying at Munsel-ling School! I have lots of friends here. My favourite subjects are English and Science. I also enjoy participating in the extra-curricular activities here, like quizzes and spelling competitions. "I’m not sure what I want to be when I grow up. But I’ve been thinking about becoming a doctor. I could then help all the sick people in Spiti. Wouldn’t that be great?"